Saddle: See under comments below. 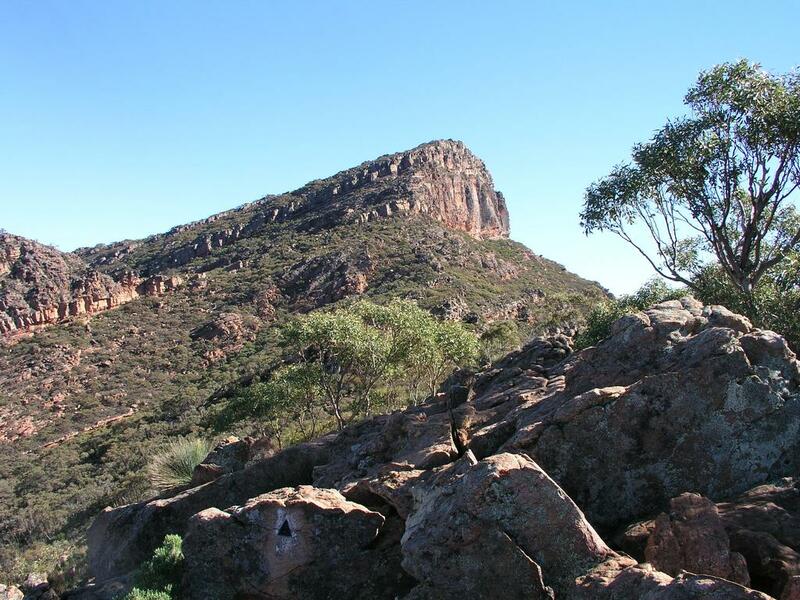 How to get there: This mountain is located in the Flinders Ranges National Park, in the state of South Australia. This park is about 460 km north of the city Adelaide. There is a small village, Hawker, about 50 km south of the park. Hawker can be reached from Broken Hill via Peterborough, about 480 km on good roads or from Port Augusta, only about 100 km (But then you need to get there in the first place). 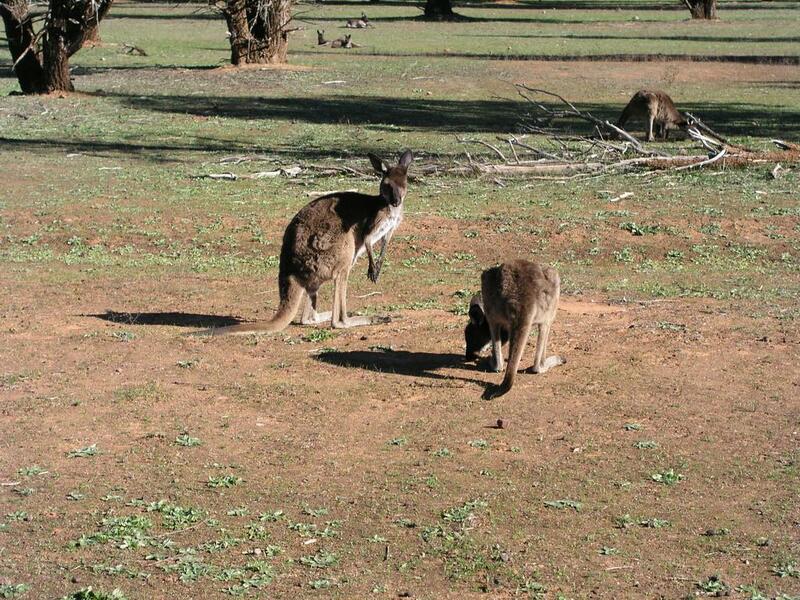 The park is more than 1000 km south of Alice Springs. The Wilpena visitor center has a general store, automobile fuel, a campground as well as a motel. 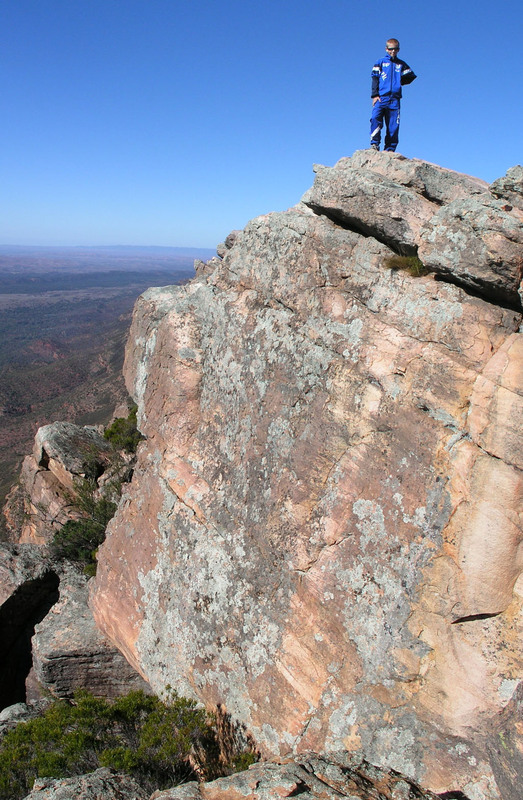 This Wilpena area is approximately 530 meter above sea level. 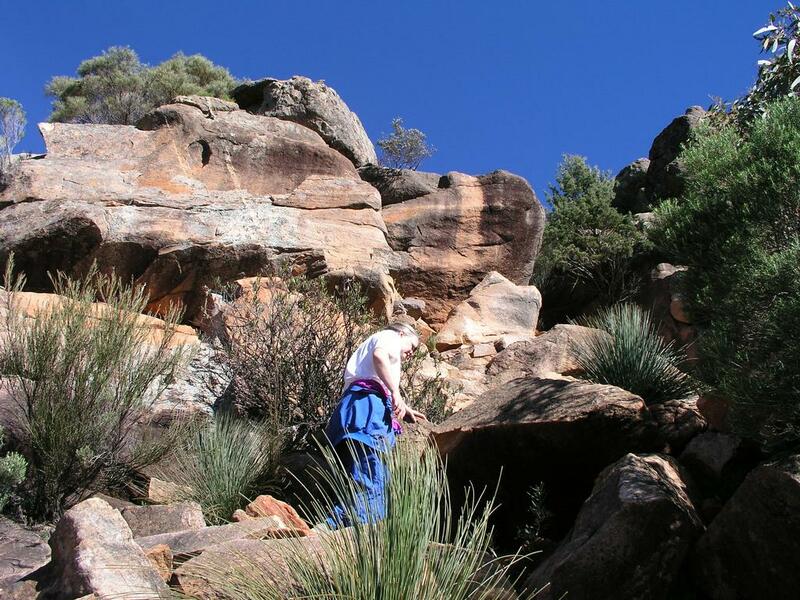 Route description: The Wilpena Pound is a remarkable "oval of mountains" with an almost flat basin enclosed inside. It does look like a crater, but has been formed by uplifting of the rocks around. The flat basin accumulates more moisture (from the slopes) and is rich in vegetation (fantastic trees) as well as a very good place for kangaroos. From the Wilpena lodge (or from the park visitor center), proceed across the creek and go upstream (passing the campground) a few hundred meters. The St. Mary Peak trail goes right at a spot with an information board and clearly posted signs. The trail is generally well marked with short metal poles some of which will tell you about your progress (in km left to the summit and/or km back to the center). The trail is easy and pretty flat the first section as it follows the outside (east side) of the "mountain oval". After about 4 km, the trail starts gaining elevation and climbs more steeply to the Tanderra Saddle. As you climb this part, you will see the steep east face of St. Mary ahead and above. In this part and for the rest of the climb, the trail is (YDS) class 2. Many people will find it natural to use a hand for support in some spots along the trail. From the saddle, a little more than one kilometer remains. The trail is well marked and easy to follow as it gains the more gentle west slope of the peak. The summit is a short ridge that drops vertically to the east. The distance (one way) is about 7 km. 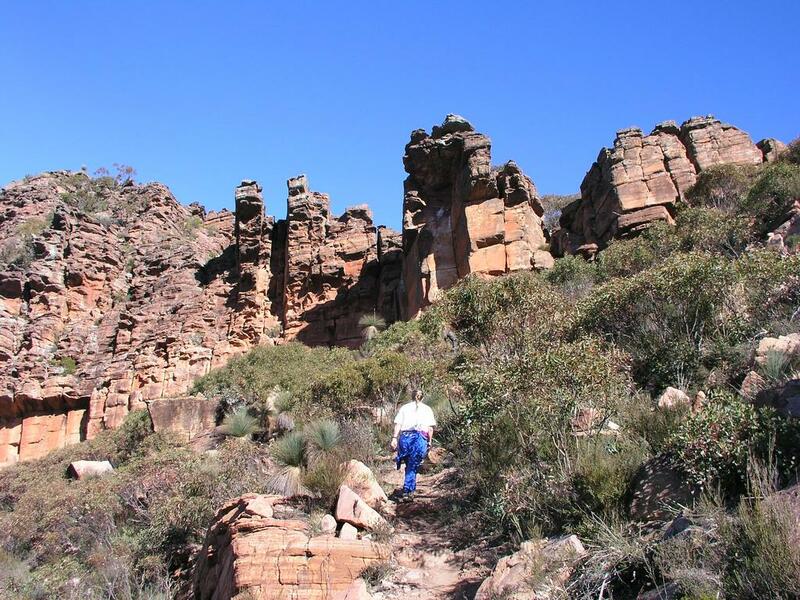 Instead of returning the same way, walk back to the Tanderra Saddle, then descend into the Wilpena Pound along a very clear trail that is easily visible as it slopes gently down in the north slope of the peak that is south of St. Mary. 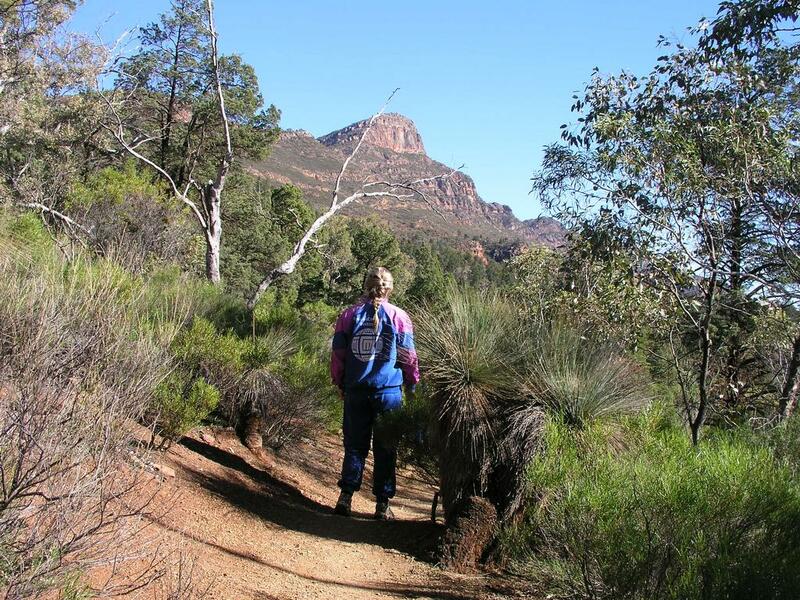 This trail will take you into the basin and then across part of the remarkable, flat floor through open forest and some grass plains with lots of kangaroos. Making this hike a circle has the advantage of seeing both the outside and the inside of the basin, the total round trip is about 20 kilometer. St. Mary Peak, as seen when the trail starts ascending. Just below the Tanderra Saddle. St. Mary Peak, as seen from the Tanderra Saddle. The terrain looks complicated ahead, but the difficulty never exceeds (YDS) class 2. Pål Jørgen on the summit. 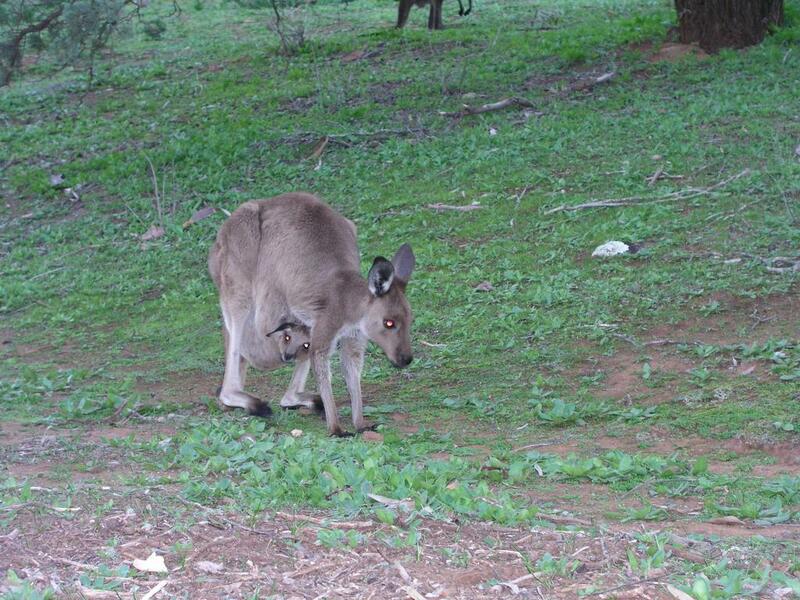 Kangaroo with baby near the Wilpena Pound. Kangaroos in the interior basin, as seen when hiking back.